Typical beer pour yielded a quick dissipating one-finger coarse white head. Minimal lacing occurred. The aroma offered is unappealing giving me the impression the brewer has tried to mask the overpowering skunk smell with copious amounts of vanilla. There are faint smells of oak but the aromas expected from beer (i.e. where are the malts and hops?) are noticeably absent. My tongue immediately picks up a skunky flavor paired with some bitterness from the hops. Gradually the vanilla hits but is undermined by a metallic aftertaste. The tastes that have the potential to impress are impaired by what tastes like a skunk sprayed some tinfoil. These flavors have no place in a beer. The beer is light to medium bodied with moderate carbonation in the mouth. The beer is dangerously close to being undrinkable for my palate; however, I have the distinct impression that the brewer has taken a very sub-standard beer and tried to turn it into a premium brew by dumping it in oak barrels. History lesson: In fact, that is precisely what has happened. Originally a Scottish company intended to make a scotch whiskey that had a beer finish. To achieve this the distiller filled the oak barrels with beer in order for the barrels to soak up the beer flavors in the wood. The beer was then discarded and the barrel was filled with scotch whiskey. Some workers of the distillery braved up enough to sample the discarded beer and discovered it was both drinkable and very unique. Innis & Gunn was spun-off to exploit this discovery. Now Innis & Gunn has the beer brewed by an “unnamed” brewery which is then put in white Bourbon barrels from the United States to age. Conclusion: An interesting beer to try but I won’t be seeking it out again. 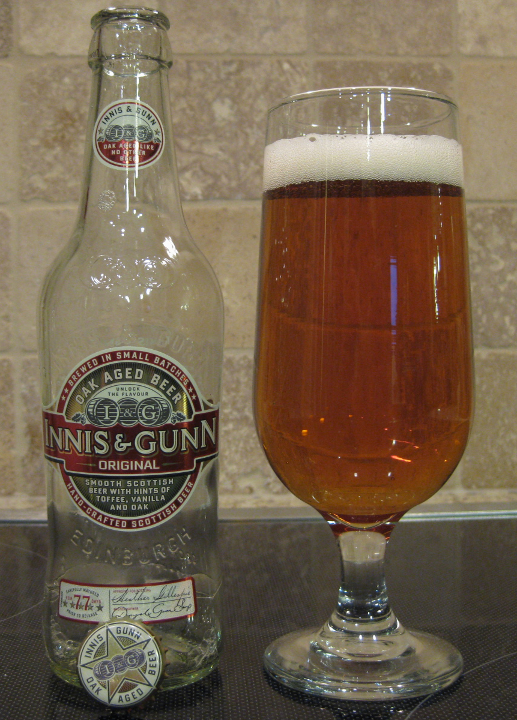 I would sample other Innis & Gunn varieties but I would not entertain the thought of buying the Original again unless I found information stating that they have significantly improved their initial beer.